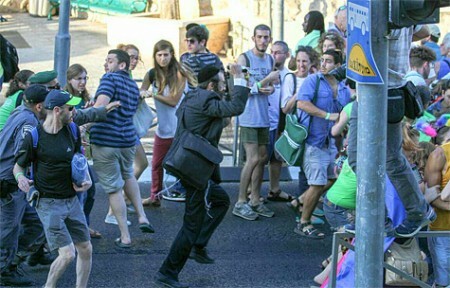 A homophobic Israeli ran amok with a knife at a Gay Pride parade in Jerusalem and stabbed 6 people. “Ultra Orthodox” nutters are very common in Israel where they blend in quite well with all the other haters and homophobes and xenophobes and Islamaphobes and misogynists. In fact, Israeli society is so narrow that if you are not a died-in-the-wool peace-hating, Arab-hating, Persia-hating, gentile-hating, Congressional-money-grabbing, nutcase you are quite likely to get sent to a mental institution. This entry was posted on Thursday, July 30th, 2015 at 3:59 am	and is filed under Zionism. You can follow any responses to this entry through the RSS 2.0 feed. Both comments and pings are currently closed.